Lightweight Walker With Brakes With Flip Up Seat. It’s a lightweight Zimmer frame with brakes, constructed from sturdy aluminium to make sure that it is as portable as it is functional. It has a smart flip up seat with built in carry handle that allows the user to take a well earned rest when needed. 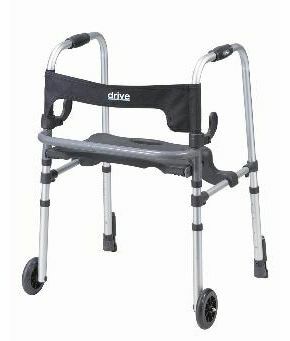 Alternatively it can be used as a traditional walker by raising the seat to step inside the frame. The seat has a soft flexible backrest that will provide both comfort and security when in use. The frame can be height adjusted to suit the user, and with special loop lock hand brakes, this item is a safe and stable purchase. A good stable frame which folds easily for storage and has the additional advantage of a fold-down seat.